Sleepy morning here in my Frankfurt hotel room! It's immediately clear I'm back on European soil as everyone is smoking and the breakfast buffet consisted mostly of deli meats. :)) Tonight I'll return to Moscow, flash my multi-entry visa and we'll be on our way to Eastern Europe! I must say the Russian visa process was quite simple compared to the hell I experienced in getting my visa for Belarus. I first applied for a 90 day tourist visa - DENIED! Then I got a call at the beginning of last week informing me they would grant a 30 day tourist visa, single entry. However, given the close departure date it would be necessary to pay "expedited" fees. I guess it's my own fault for not asking how much these fees were, but when I picked up the visa the cost was $458 USD! Yes, $458 for a single entry visa. Extortion!! :) I didn't understand what all the fees were and when I tried to ask the Embassy staff to explain they simply said - "this is the cost if you want the visa!" Excellent customer service! Yes, Americans are mostly visa virgins. We need them for very few countries, but I'm certain this Belarus visa is a complete scam. Denying the visa at first, then forcing people to pay expedited fees at the last minute. We were initially going to be in Belarus only in transit, but will now stop in at least one city. I don't know which one, or even on what day as our schedule is still fluid. Unfortunately, Belarus is not like Russia where Americans can get a multi-entry visa for several years. So we must make the most of this expensive single entry ticket to the country because I will not pay the fees again for another visa. 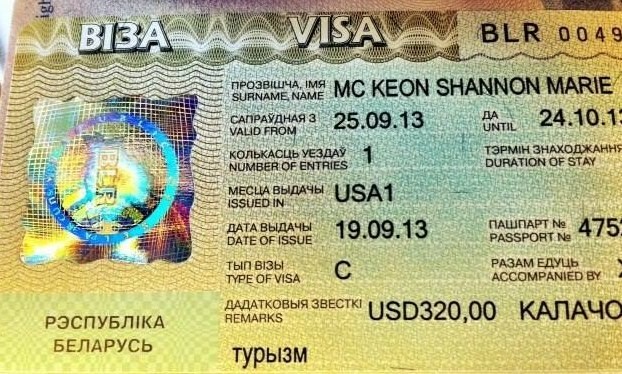 Russians - the masters of visas! I know you need them for almost every country. What is the most expensive or difficult visa you've obtained? And how hard is it to get a tourist visa to America? Has anyone applied and been denied? The most difficult visa for me to obtain was Schengen visa. As the purpose of my visit was business trip to the conference in Prague, I had to apply for visa at Czech republic Embassy. I had to do this personally, await in huge queue for more than 5 hours and finally get their reply that they need more documents and that they will not proceed with my application at all until I bring everything that they've asked. Luckily, I changed my trip itinerary and got my visa from France Embassy. People there were much more polite and agreed to wait until I send them electronically (!) some documents. Actually, Russians also have a lot of visa-free / visa-upon-arrival countries and e.g. if you go to Argentina you pay more than 100$ upon arrival even you don`t have to have a visa to Argenitina, Russians go to Argenitina for free. As well as for Tanzania Russians pay 50$ on the border for a visa, US citizens pay 100$. Feel the difference :-) I can continue to count examples. US visa is very simple, but anyway there are a lot of stories when people were denied, but got it later. The most difficult visa for Russians nowadays seems to be Canadian visa. All others well-known countries are much less. (Of course, we do not talk now about countries like Saudi Arabia and so on). This is good to know! I always feel bad for the Russians I know because it seems they need visas everywhere but apparently not. :) I've never traveled in South America. I know U.S. citizens need a visa for Brazil, maybe it's the same for Argentina. You`ll like Belarus, i think. Nice place, Nice and friendly folk. I hope so! Everyone tells me people are more friendly and open there when compared to Russia. Belarus desperately needs foreign currency to keep their own currency afloat. This is why they use every opportunity to rob others (even Russian companies!). I never had problems with visas. US and British visas were made for me by companies where I worked. And tourist-oriented countries like India, China, Greece, Italy do not make much troubles for visitors. But they may be slow in peak seasons. Please do not forget to let me know when are you going to visit Belarus! And BTW in Moscow the centralized heating season has started today, at least in my house. Switzerland and Italy were very easy to obtain for me. This summer my son (17 y.o.) had to go to Great Britain and their application was full of questions which I would call at least very strange and then even offensive, for instance what is the month income of your family or how much does you family usually spend for food... also they were eager to know my (as a mother) maiden name, day and place of both parents birth and needed our marriage certificate. My congratulations for your success, but please remember that the visa obtained does not garantee that you enter the country (as we are often told): the final decision is to be made by passport control officer. Welcome to Germany! Wish you were in Stuttgart , i would show you around. My mom had some troubles to get her first visa to US, even having her daughter there and American son-in-law NAVY officer. But it was the issue of the locals working for our Embassy, not the american embassy personal. And the latest: Germans gave her and my step-dad some hard times, and again those were not the Germans working in the Embassy , but some local clerk who was extremely rude to a couple of old people. He is not working anymore) . I obtained visa to Spain and Germany without any problems. I'll be in Minsk from 30 September till 4 October. And then back again in Brest. Thank you! I don't know the dates we'll be in Belarus, but I'll try to write you if I have time and Internet access. I'll have no mobile during the trip. But it is not comfortable that you cannot catch cheap flight and tours becuase you haven't visa. You did not need a visa for Greece? It is horrible that they made you pay so much for your visa! I was denied an American student visa twice in a row. Can't call it a pleasant experience. But the year after that I finally got it. Funny thing happened also - the person who interviewed me the year before came up to the window where his colleague was interviewing me and said - "Oh, I remember her, I didn't issue a visa to her" - was so nice to hear that. But I was issued it anyway. My boss, who is an American, was sure that once a person was denied US visa twice, he would never be able to get it - don't know why he thought it was true. I know that it is much easier now to get a visa now. Less docs and less questions. Shenghen visa - my husband and I were issued a one-entry 10-day visa to Finland just because we are permanently registered in a different region, namely, Karelia, which also borders with Finland. Did they give you a reason why they denied the visa? I asked, but they gave me no answer. It's totally in their discretion to do so. It's great that Russia/America now have the multi-entry visa for three years. Saves a lot of time and trouble. I'm glad the third time was the charm for you with the American visa!! US visa is a hard to get thing if you don't have a green card, work or student invitation, and don't have some foreign visas in your passport. All of my foreign friends easily got U.S. visas, but they travel a lot. I think a main hindrance is if you have no other foreign visas as a Russian citizen. I guess they think you are more of an illegal immigrant risk in this case. One reader wrote me that his child was going to come here to study English, but they had visa problems. Pity! I don't mind paying a fee, but $458 for single entry? This is robbery! :)) I've never heard of a visa costing so much. You can get a multi-entry visa to Russia?! Please, show me where i can do my research on that!! =) I've been trying to convince my american friend to travel to Russia, but the visa issue is what stops him. The last time he has gotten a visa, it was a 90 day single-entry tourist type. And it took him super long to apply and wait for it. I would much appreciate if you share some usceful info on that. Thank you for the invitation! The visa scheme changed in September 2012 to allow for multi-entry visas. You can read about it here - http://moscow.usembassy.gov/russian-visas.html. The main thing is getting the "invitation" letter. Unless you're going with an official tour group, this is next to impossible to arrange. So you have to pay a third-party service to generate the invitation letter for you. There are lots of online services for this. My husband applied for the American visa and was denied, but it was not a tourist but a business visa, and it was 10 years ago, that time he was single. But later he successfully got a British visa (also business). As for me I have had only Finnish visas, but Finland has simple visa system for the citizens for the North-West part of Russia (which has a border with Finland). As far as I know it is more difficult to get tourist visa to UK that to US (but this information is based only on my friends' and colleagues' experiences). You can visit all countries of the west Europe without visa, only with your foreign passport, can't you? P.S. Good luck in Belarus! I hope you will find interesting things there, worthy to pay so much money for visa! Yes, we can travel everywhere in Western Europe visa free. The only countries for which I've needed visas in all of my travels are Russia and Belarus. Ukraine is also visa free.